Alaric I (Gothic: *Alareiks - "supreme chief"; b. 370 (or 375) – d. 410) wis the first Keeng o the Visigoths frae 395–410, son (or paternal grandson) o chieftain Rothestes. ↑ Wolfram, Herwig (1997). 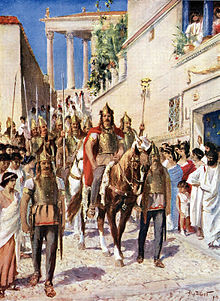 [Alaric I at Google Books The Roman Empire and Its Germanic Peoples] Check |url= value (help). University of California Press. p. 90. ISBN 0-520-08511-6. ↑ Settipani, Christian (1993). La Préhistoire des Capétiens, 481-987, Première Partie. Villeneuve d'Ascq. p. Tableau 1. This page wis last eeditit on 22 Februar 2018, at 02:52.